Every year at SXSW, brands try to wow attendees with the most intricate and immersive brand experiences. And 2019 was no different, with brands pulling out all the stops to amaze and delight attendees. The annual film, media, and music festival and conference that takes place in Austin, Texas, gives brands from all over the world the perfect platform to reach a huge and highly-engaged audience. Here we take a look at the extraordinary brand experiences that stole the spotlight this year. Bringing Armageddon to Austin, Amazon Prime welcomed guests into the Garden of Earthly Delights with an otherworldly cast of angels and demons to celebrate the launch of new series, Good Omens. The immersive space featured a 20ft-tall tree from which wines and beers were served, a pampering lounge, a pop-up book store filled with leather-bound delights, and even a Hell Hound Puppy Pen. Prime also flooded the streets of Austin with unearthly characters including bickering angels, chattering nuns, demons and Witch Finders to attract and delight visitors. Want to make the first move? 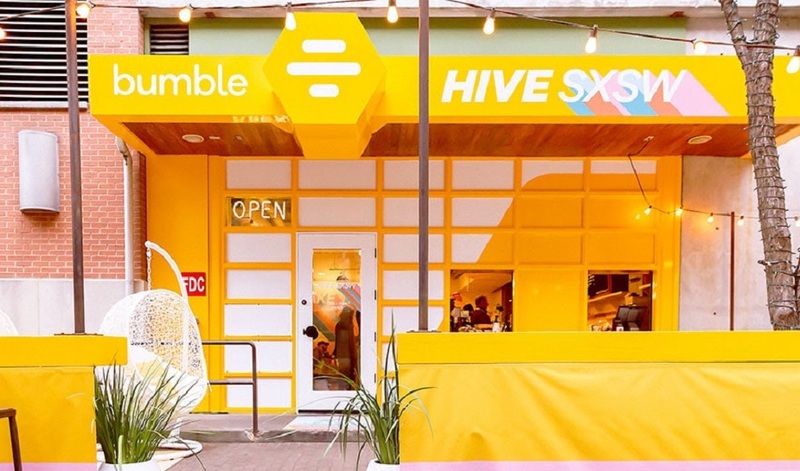 Popular dating app Bumble brought its popular Hive to SXSW, an intimate space designed to connect with users and create meaningful, one-on-one relationships. Painted in the app’s well-known yellow palate, Bumble took over a local coffee shop with a physical dating hub that provided profile experts to help shape user’s profiles and free taco-breakfasts and coffee. The Instagram-friendly, cosy pop-up also delivered a fun programme of themed activities including inspirational talks from female gamers, a dog lover’s brunch and a workshop for making friendship-bracelets. ADP – in partnership with Wired Magazine – gave guests at SXSW an opportunity to physically break down barriers in an exciting and thrilling activation that addressed fairness in the workplace. Attendees were dressed in branded safety gear and could take their pick of weapon before entering the Empire Control Room. Inside they whacked, battered and smashed objects which represented workplace barriers, including a piggy bank in the wage inequality room. Smashing! Bringing the popular Game of Thrones TV series to life, HBO created a highly-memorable activation that doubled up as a blood drive. The “Bleed for the Throne” experience thoroughly immersed guests in the mythical kingdom of Westeros while increasing blood donations. Looking like they had stepped straight off the set, robed choristers sung the familiar but eerie score while Wildings prowled, a Khal Drogo look-alike whispered intimidating threats and perhaps most importantly to Game of Thrones fans, the blood-soaked iron throne sat at the head of the room. Every year we’re left thoroughly amazed and inspired by the creative ideas we see brought to life at SXSW. Our very own David Balfour attended this year - check out his blog post on his favourite speakers.